The concept and the term information technology is so large that no precise and comprehensive definition, encompassing all the aspects of IT, can be given. Because information technology is set of various diversified and multidimensional technologies. IT is a pool of technologies that merge computing with high speed communication communication links carrying data, sound and videos. 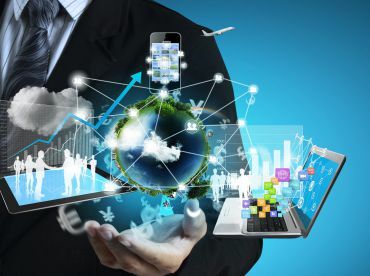 Examples of information technology include personal computers, of course, but also new forms of telephones, televisions and various handheld devices, such as personal digital assistants. It should be noted that there are two parts of this definition, the computers and communications.A computer is a programmable, multi-use machine that accepts data, the raw facts and figure, and process or manipulates it into information that we can use, such as summaries totals or reports. Its purpose is to speed up problem solving and to increase productivity. Communication technology also called telecommunication technology consists of electromagnetic devices and systems communicating over long distances. The principle examples are telephone, radio broadcast, television and cable TV. More recently, there has been an addition of communication among computers, when people tell you that they "went online" with the Internet. To be online means using a computer or other device connected through a voice or data network, to access information and services from another computer or information device. Media industry has been growing rapidly. Today the role of media not only to inform but also to entertain and educate the people about their rights. The word media is broad now, it includes- Print, television, internet, radio, magazines and so on. with the time, media is also changing its attitudes towards the coverage of news.Media industry offers good career opportunities, but to make a Career in media industry is not easy task as people thinks. Media industry demands creativity, committment, hardwork, dedication and the in-depth knowledge of socio, economic,political issues. Today we are so much depend on media that we could not think of our lines without it. Imagine a day, you wake up from your bed and no newspaper, TV, internet to bring you closer to the world. Don't you think you will feel cut off from the world. We develop & design various websites, mobile applications & system application as per demand. We also provide various Digital Marketing services. JIPL runs its own media channels.